Aviation Updates Philippines - Are you the Juan? The Philippines' leading low-cost carrier, Cebu Pacific Air, hires 100 new cabin crew members to fill the job vacancies as the airline expands its operations. Cebu Pacific will need more flight attendants to facilitate their passengers in the international and domestic sectors. Are you the Juan? Be part of Cebu Pacific's cabin crew now! Cebu Pacific will be searching for flight attendants all over the Philippines. The airline will conduct job interviews in nine key cities all around the Philippines namely Boracay, Davao, Iloilo, Zamboanga, Dumaguete, General Santos, Legazpi, Bacolod and Manila. “We will be going to key cities all over the Philippines, in search of fun and dynamic individuals who can be part of the Cebu Pacific family. As we expand in Asia, the Pacific and the Middle East, we look forward to providing more career opportunities to everyJuan,” Cebu Pacific Air Vice President for Marketing and Distribution, Candice Iyog said. “Aside from unlimited travel benefits, competitive compensation packages, annual performance bonuses and a fun working environment, our employees also enjoy career opportunities that keep them close to their families. We encourage everyone to join us in providing high-quality service all over the world,” Iyog added. Recruitment fairs will be held in Boracay (Patio Pacific Boracay) and in Davao (The Royal Mandaya Hotel) on May 30; in Iloilo (Sarabia Manor Hotel) and Zamboanga (Garden Orchid Hotel) on June 6; in Dumaguete (La Residencia Almar Hotel) and General Santos (Roadhaus Hotel) on June 13; and in Legazpi (Pepperland Hotel) and Bacolod (Sugarland Hotel) on June 20. 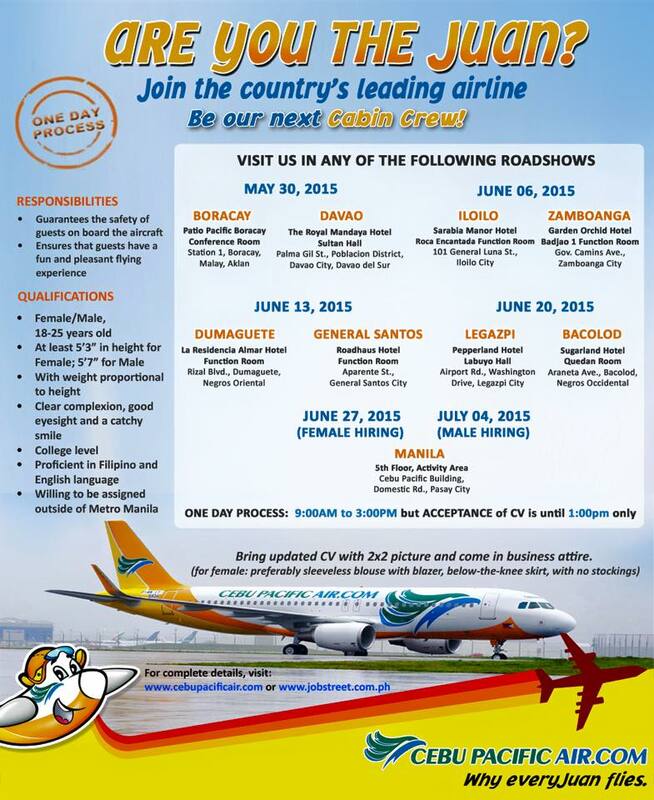 In addition, Cebu Pacific will hold recruitment fair at Cebu Pacific Building, Domestic Road in Manila. According to the airline, female cabin crew applicants may visit on June 27, while male cabin crew applicants may visit on June 4. The airline will process the applications on the same day, between 9 AM to 3 PM. Acceptance of updated curriculum vitae will be until 1 PM only. Bring updated CV with 2x2 picture and come in business attire. Female persons should preferably wear sleeveless blouse with blazer, below-the-knee skirt, with no stockings. In its 19th year of operations, CEB has flown over 100 million passengers. CEB and Cebgo, its wholly owned subsidiary, operate flights to 34 Philippine and 28 international destinations. For more information, please visit www.cebupacificair.com or the airline's page on www.jobstreet.com.ph.